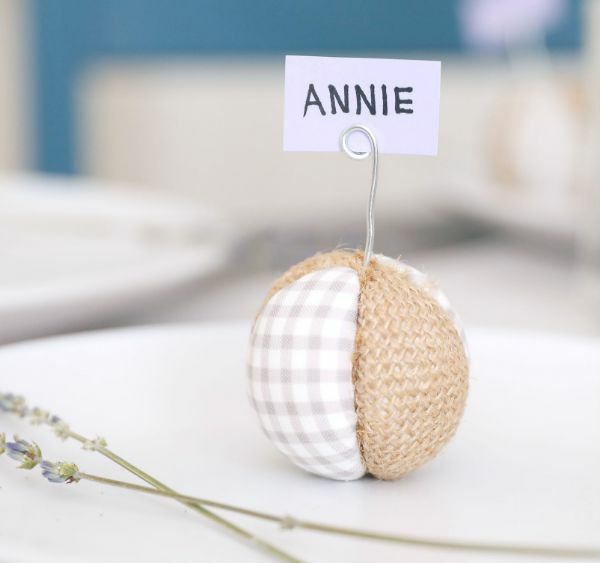 Welcome guests to your table with these simple and attractive place settings made with Styrofoam balls. The gingham fabric and rustic burlap are great for a casual dinner, but you may customize these looks for any occasion. For example, during the holidays, you can use novelty prints that go along with that holiday theme. The fabric covers the Styrofoam ball, which is sectioned like an orange. When you draw the pattern for the fabric cutouts, envision a diamond that has slightly rounded points. 1. Hold the ball in your hand and draw a circle along the ball's circumference using the pencil. Rotate the ball 90 degrees and draw another circle around the circumference, bisecting the first one. This sections the ball into four quarters. 2. 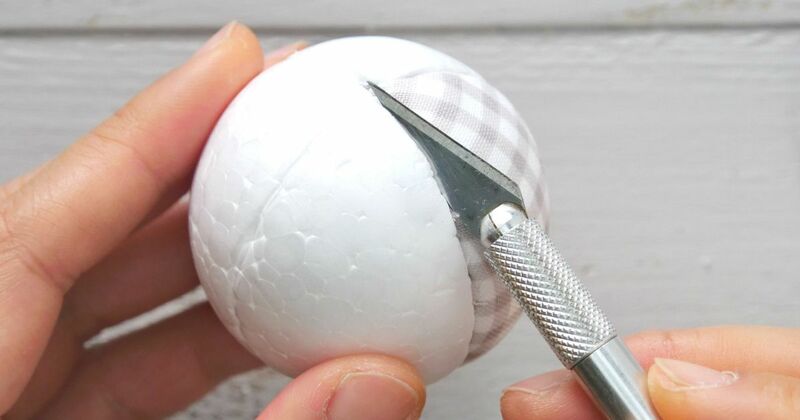 Score along the drawn lines with the craft knife, going 1/4 inch deep into the Styrofoam ball. 3. Place the paper so that it is longer from top to bottom. Draw a rounded diamond shape on the piece of paper, with 1/4-inch margins at the top and bottom, and 1/2-inch margins at the sides. Cut out the shape. 4. Trace the shape in two places on the fabric. Cut out the shapes. 5. Trace the shape in two places on the burlap ribbon. Cut out the shapes. 6. Place one fabric diamond lengthwise over one sectioned part of the ball. Use the back of the craft knife's blade to press the fabric into the crevices. Trim any fabric that might stick out of the top and bottom. 7. Place one burlap diamond lengthwise over the sectioned part to the right of the fabric section. Use the back of the craft knife's blade to press the burlap into the crevices. Trim any fabric that might stick out of the top and bottom. 8. Place one fabric diamond lengthwise over the sectioned part to the right of the burlap section. Use the back of the craft knife's blade to press the fabric into the crevices. Trim any fabric that might stick out of the top and bottom. 9. Place one burlap diamond lengthwise over the remaining uncovered section. Use the back of the craft knife's blade to press the burlap into the crevices. Trim any fabric that might stick out of the top and bottom. 10. Cut off 4 inches of wire. Use the pliers to coil one end twice. 11. Write the attendee's name on a small piece of paper and slide it between the wire curls. Stick the wire in the top of the Styrofoam ball. Place the ball on the attendee's plate. Enjoy your new Styrofoam place settings. Share on Facebook!